Between summer plans of birthday parties, baby showers, baseball games, bridal showers and cookouts, our fridge is always stocked full with veggies, fresh herbs and cheese. For us, entertaining is really easy when we let our ingredients do the work for us. We save time by using a “pour and serve” dipping oil, and dress it up with “fancy” cheese, fresh herbs and ripe tomatoes. All we had to do is skewer and plate, and as you can see from our pinterest fans below, this recipe is well liked! Arrange one of each item on the skewers. I would start with folding the basil and placing it on first followed by the mozzarella ball and then the tomato. 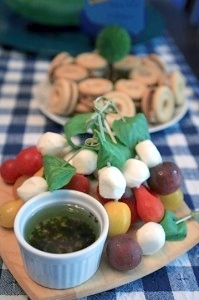 Place finished skewers on a serving plate with a dipping bowl of the Tastefully Simply Balsamic & Basil Dipping Oil*. Add your balsamic vinegar and basil to a small pot over medium low heat. Allow the vinegar to reduce by half and become slightly thick. Remove from heat and pick basil leaves out. The basil will infuse into the balsamic reduction. Season with salt, pepper, oregano and red pepper flakes. Drizzle in your olive oil and whisk to combine. Pour it into a small dipping bowl and place on the serving plate.